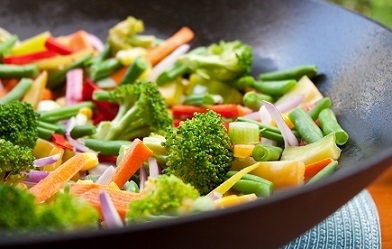 This Vegetable Stir Fry Recipe uses a minimal amount of vegetable oil, so it is very much a heart-healthy, delicious way to prepare the vegetables. The recipe is very flexible. You can add more vegetables, or substitute those listed here for some of your own favorites. It's clean out the frig day! I often add red pepper, snow peas, water chestnuts, mushrooms, napa cabbage and/or even cashews to this stir fry and then serve it over Jasmine or Basmati rice for a wonderful and complete meal. 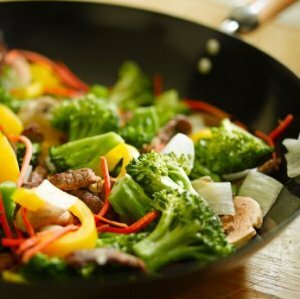 A vegetable stir fry can be used to accompany almost any other foods you'd like. I love to serve these with the recipes for Marinated Sesame Chicken and Asian Roasted Salmon and the Pepper Steak. Preparation time: 10 minutes. Serves 6. This vegetable stir fry has approximately 11.30 grams of carbohydrates per serving (assuming 6 servings) for those of you counting carbs. Enjoy your vegetable stir fry recipe and the company of those you share it with! Did you know? 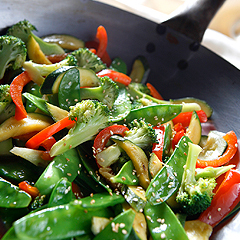 One of the essentials of stir-frying is what is called "the taste of the wok." This "taste" comes from high-heat contact between the ingredients and the metal. Once again, if the wok or sauté pan is not hot enough, the food will taste braised, or even steamed.